Here is our practical guide for Le Relais du Vieux Beaune. This is where you'll find all the information from to use the parking permit, run the dishwasher or how to reset a breaker. To get back to the main Guests Information page, use the Back to the Guests Information page link posted at the bottom of all of this guide sections. First, get on to the circle road around Beaune. Thisroad is known as “The Boulevard” and is the big thick road marked in orange and pink. This road only goes in one direction. Keep going around it until you approach the “Rue du Chateau” to your left. This road is a continuation of sorts of “Avenue de 8 Septembre” which has the train station, or “gare” at the far end. Keep driving straight until you reach the “Place Dr. Jorrot”. In front of you will see a painted wall mural of a scene with some people in it (including some nuns). The rue Rousseau Deslandes where Le Relais du Vieux Beaune is located is the street which runs just to the right of this mural. If you see any available parking spots on this place, this is a good place to park, although it is pay parking. However, we leave a city parking pass for you up in the apartment that is good for these spaces. Veer right on to the rue Rousseau Deslandes, our apartment is at #19 rue Rousseau Deslandes ‐ a building with a creamy yellow façade. Although it is tight, you can park on the left side of this road with the city parking pass left at the apartment. This is a good spot to park when you unload your bags as it is very close to the apartment door. It is a short walk from the train station to the apartment. It is flat, so unless you have lots of luggage you can easily walk between the train station – “La Gare” and Le Relais du Vieux Beaune. For taxis, it might be a good idea to organize one in advance. Once you find the apartment building (#19 Rue RousseauDeslandes) you will find the key pad to the left of the building front door. Press the code I have emailed you, and then open up the door while it buzzes. Do not lock this door with your key, but do make sure it properly shuts after you. The apartment door is up the flight of stairs and has a brass #4 onthe upper left hand corner of the door. You will notice two metal lockboxes mounted on the right hand side of the doorjam. Open the black shutter door (it slides down) on the BOTTOM lock box. This will reveal the dials and release button. Rotate the dials to the combination, which I have emailed you. Press down on the release button to open the door. Pull the door fully open. Remove the key inside. Close the compartment door. Remix the numbers on the dial a bit. Slide up the black cover again. The key you now have will open the apartment door in front of you. The door handle needs to be yanked down firmly to open the door. When leaving the apartment, the handle has to be yanked firmly upwards to shut the door so that you can lock it. Please make sure to lock the door every time you leave the apartment, as well as shut the main door to the building firmly behind you. On your departure day, please lock up the apartment, then putthe main key in the metal lockbox where you found it and scramble the code. If you have two keys leave other key on the kitchen table with the City Parking Pass. The door handle to the apartment needs to be yanked UPWARDS very firmly to close the door properly in order to lock it. DO NOT under any circumstances turn the dial on the radiator in the bathroom. This needs to be left in its current position (on) for the gas furnace to function properly. As a temporary resident at #19 rue Rousseau Deslandes please keep noise to a reasonable level wherever possible. This is especially important during the late evening, night, and in the early morning. Please make sure the front door to the building is shut firmly behind you when you are going in and out. However, DO NOT lock either the front door to the building or the door to the courtyard with your key. Feel free to leave your rental bike in the courtyard under the covered area where the other bikes are – make sure they are locked. It is against building rules, however, to store bikes in the apartment. Please take care of your parking pass – it is very expensive to replace! Don’t forget to leave the parking passes on the kitchen table when you leave. To start the dishwasher, the “power” button needs to be pressed in (and keep pressing on it) for about five seconds or so until you hear a “BEEP!” Only then will the cycle start. If it is hot out, closing the shutters and windows during the warmest part of the day, and then opening them at night to let in the fresh air, really helps keep the apartment cool. The buzzer for our apartment is the fifth from the top (marked “Bradbury”). You can use the big garbage bin in the courtyard to drop off your full bags of garbage. However, PLEASE DO NOT PUT ANY GLASS, INCLUDING BOTTLES, IN THESE BINS. For bottles, glass and other recycling, there are recycling bins in front of the painted wall mural on the Place Dr. Jorrot. Please enjoy the books we have left for your enjoyment during your stay with us. If you have any books that you have read and don’t want to take home with you, we are always delighted to accept “donations” to our library. Don’t forget to sign the Guest Book before you leave! See our Upon Departure instructions for departure to do checklist. Please leave the parking pass on kitchen table before leaving the Relais, it is valuable! If the pass is lost and / or taken with you, the cost will be deducted from your security deposit. Here at the apartment we have left you a city parking pass (laminated card called the “Carte D’Abonnement Riverain”). This pass allows you to park for free in all of the zones blocked off in green & yellow on the city map on the flip side of the laminated pass. You will see that, with this pass, right near the apartment it is possible to park in the “Rue Rousseau Deslandes”, “Place D. Jorrot”, the “Rue des Tonneliers”, and the “Rue Thiers” without having to feed the meter. In order to use this card, you need to, place this card map side down, date side up on the dashboard of your car in a visible spot. Please see the map below for information on the numerous parking spots situated around the apartment. 1. RUE ROUSSEAU DESLANDES - Le Relais du Vieux Beaune located at # 19. If you park here, as many of the building’s residents do, make sure you squeeze well over to your left - the street is narrow. Your city Parking Pass that you will find in the apartment on arrival (make sure it is visible) means you don’t need to plug the meter. 2. PLACE Dr. JORROT & RUE DES TONNELIERS - It’s where we like to park. Use your city Parking Pass so that you don’t need to plug the meter. 3. PARKING SAINT-ETIENNE - Underground, secured pay parking. 4. PARKING DES CHANCELIERS - Underground, secured pay parking. 5. AVENUE DU HUIT SEPTEMBRE aka AVENUE DE LA GARE and parking lots in front of train station - Free parking. There is also lots of free parking around the “Boulevard” (the ring road) around Beaune. You will notice that much of the rest of the parking in Beaune is meter parking, such as around the Place Carnot. For these areas of metered parking NOT covered by your “Carte D’Abonnement Riverain” BUT if you press the big green button near the bottom of the parking machine it will automatically generates a 15 minute free ticket (in the high season) or a 30 minute free ticket (in the winter). The apartment internet & WIFI are provided by the Livebox modem router, i.e. the white box located in the TV cabinet in the living room. If needed, you can also use the grey ethernet cable attached to the router to connect your compatible devices to the internet. If the internet connection is down, you should see a red light under the @ on the front of the modem router. Restarting the modem router might fix the problem. You can do so by using the On/Off switch on the left side of the router - O/I switch on the picture below. Turn it off wait a few second and turn it on again. It will take a minute or two for the modem to be reconnect. We do our best to ensure that the interenet & WIFI is available for our guests, but sometimes due to circumstances beyond our control - equipment failures, line malfunctions - the service goes down. As such we cannot guarantee this service but do promise to do everything in our power to rectify such issues as quickly as we can. No charges for receiving calls. Calls from the apartment phones to French & North American landlines and cell phones are free. Calls to landlines in Germany, England, Australia and New Zealand are free. for free calls, there is a 250 different numbers/month limit - after that limit has been reached, calls will trigger a charge. Subsequent phone charges will be deducted from your damage deposit. The phone connection is provided by the the Livebox modem router - the white box located in the TV cabinet in the living room. If the phone connection is down, you should see a red light under the @ and/or phone symbols on the front of the modem router. Restarting the modem router might fix the problem. 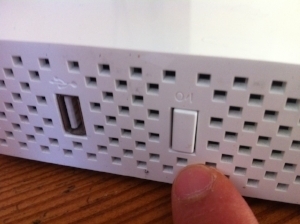 You can do so by using the On/Off switch on the left side of the router – see the O/I on the picture. Turn it off wait a few second and turn it on again. It will take a minute or two for the modem to be reconnect. We do our best to ensure that the phone connection is available for our guests, but sometimes due to circumstances beyond our control - equipment failures, line malfunctions - the service goes down. As such we cannot guarantee this service but do promise to do everything in our power to rectify such issues as quickly as we can. Please do not throw any glass items (including bottles), newspapers, or magazines in the garbage bins in the shared courtyard. These items must go in the recycling containers installed in the place docteur Jorrot at the beginning of our street. See below for details. plastic bottles - drinks, shampoo, detergent,etc. Other plastic containers and wrappers go to the regular garbage red bin. Putting recyclable items in the building's garbage causes problems with the garbage pick-up. The red bins are emptied on Tuesday and Saturday. The yellow bin is emptied on Thursday. Both the heat and hot water in the Relais du Vieux Beaune are gas powered. The gas heater can be found in the bathroom (big white thing mounted on the wall to the right of the door). To find the control panel for the heater, just flip open (downwards) the flap at the bottom. Please do not fiddle with anything besides the buttons we mention below. DO NOT TOUCH THE DIAL ON THE RADIATOR IN THE BATHROOM – DOING SO CAN BREAK THE HEATER!!! The Hot water is always turned on. When the water is turned on, but not the heat, the control panel looks like this, with a green light above the water signal. If you are too warm just make sure the heater panel looks like this – there will be hot water but no heat. Do not touch the dial on the bathroom radiator! NEVER touch the dial on the radiator in the bathroom itself! This one needs to stay on the same setting for the heating system to function properly. Otherwise, you can adjust the dials in every individual room to heat according to your wishes. The little arrow just past the “2” is the “comfort” setting which generally provides a nice, constant temperature. If you have any issue with heating or can’t quite figure it out contact us and we will assist. Once the TV is turned on you have to press the input button on the TV clicker to switch between the TV / CABLE TV / DVD PLAYER. The CABLE TV is provided by the company Orange - we have a package with them that includes the internet, the phone service and CABLE TV. Click here for a copy of the Orange CABLE TV channels list, Channels on a white background are included, channels on a grey background are not - except for the English channels. The Orange CABLE TV give you access to paying content like Video On Demand. Any charges triggered by content you purchase will be deducted from your Security Deposit. Is the Orange CABLE TV on? First, check that the internet connection is on. The apartment internet connection for the WIFI, appartement phones and TV are provided by the Livebox modem router, i.e. the white box located in the TV cabinet in the living room. For the TV there is also a dedicated box located by the TV. Navigate to the TV block as on picture above using the commands arrows located on the back part of the remote, and push the OK button. When you arrive on that first screen, and at any time using the CABLE TV box, ou can also just push on the Channel Up or Down button to go to the last played channel. Make sure the connection between the Orange CABLE TV box and the TV is tight. go to channel 398 and stay on that channel for 10 minutes without switching channels. Power the CABLE TV box back On. Power On the CABLE TV box. USB plug - plug a USB key and read content. TV card - gives access to the service, should not be removed or tempered with! Light indicating if the box is On, Off or sleeping. Hard disk slot - optional. Button for ejecting hard disk. Ethernet plug - for receiving TV signal. Audio plug - HI-FI system. S/PDIF plug - Dolby Digital Home Theater. Select washing program button - Push Off and rotate to select, Push On to start wash program - NOTE: it won't start if the ON/OFF switch is OFF. There are different ways to programme the oven. Programming the type of heating, temperature or grill power. The oven can be programmed with the cooking time (duration) and the end time for each dish. For more information, see the chapter Setting the time functions in the oven notice. Note: Preheat the oven before inserting the food in order to avoid condensation on the oven glass. Select the type of heating using the function control knob. Set the temperature or required grill power using the + or - sensors. The oven will begin to heat up. Set the function control knob to the zero setting. The type of heating and the temperature or grill power may be changed at any time. If you lose electrical power, first check that it is not a problem from the electrical company by checking if there is power in the other unit & common area of the building. If only the apartment has lost power, you can reset it on the circuit breaker panel located by the entry door. The circuit breakers provide protection for each of the electrical circuits by stopping the flow of current if an overload or fault occurs. First things to do is to turn off or unplug all of the devices that are plugged into the circuit. Make certain no dangerous condition exists before restoring power. Then check the main breaker. If there is no issues with the main breaker, it should be on I like it is on the picture below. If it is on 0 it should be reset by pushing it to the I position. A circuit breaker which has been tripped will usually be in the "OFF" position, like in the picture below. However, sometimes the switch will not look like it has tripped and may appear as though it is in the "ON" position. If none of the breakers appear to be tripped, gently wiggle each one, the tripped breaker will usually feel looser than the other switches. Locate the tripped circuit breaker and reset it by pushing it all the way to the "OFF" position and then back to the "ON" position. Often when you cannot reset the circuit breaker, it is because it must be turned all the way to the "OFF" position first. If the circuit breaker trips again before you have turned anything on or plugged anything in, the breaker itself may need to be replaced. If the circuit breaker trips after plugging in or turning on a device, that device may have a short or may be placing too much of a load on the circuit. Garbage & recycling have been disposed off - see Garbage & Recycling instructions. Door is locked and key is put back in the metal lock box where you found it and code is scrambled (this way if you have forgotten something inside you can get back in again). If you have two keys leave other key on the kitchen table. Bon voyage et Merci Beaucoup!